I had these Sweet Potato Chickpea Tots while in Napa a few weeks ago. They were so delicious and they are very kid friendly. A great way to sneak some veggies and beans into your kids. The original recipe came from Bellingham Middle School in MA, which is ironically next to the town I grew up in! I made a few changes to the original recipe, and I think they came out great! I topped them with my Homemade BBQ Sauce. I hope you enjoy them as much as we did! This recipe makes a lot of tots, but they do freeze very well. To freeze, simply lay them on a lined baking sheet and place in the freezer. Once frozen, you can pop them into a ziplock bag and freeze them for up to 6 months. These healthy tots are also gluten free and vegan. A healthy dinner option for your kids!! 2 cups cooked chickpeas (If using dried chickpeas, cook and save the liquid. If using canned, please do not drain the liquid. Place the shredded potatoes on a lined baking sheet . Bake for about 20 minutes. Only until tender. Please be careful not to over cook. Once the potatoes are done, increase the oven temp to 400. In a food processor , puree the chickpeas, INCLUDING the liquid, until smooth. In a medium mixing bowl, combine the shredded sweet potatoes, pureed chickpeas, green onions, spices and salt. Cover and refrigerate for 45 minutes to make the tots easier to form. Using a cookie scoop , form the tots and place each one on a lined baking sheet . Gently flatten each one. Bake at 400 for 10-12 minutes, or until lightly browned. These should last about 10 days in the fridge and up to 6 months in the freezer. Enjoy! Yum! These look awesome. I love using potatoes and sweet potatoes as egg and breadcrumb replacements. Great recipe! Hi Nina! I think freezing after cooking would be ideal. Just lay them on a baking sheet, freeze and then pop into a freezer safe bag once they are frozen. :) My book is definitely on Amazon UK. You are so welcome Kristen! 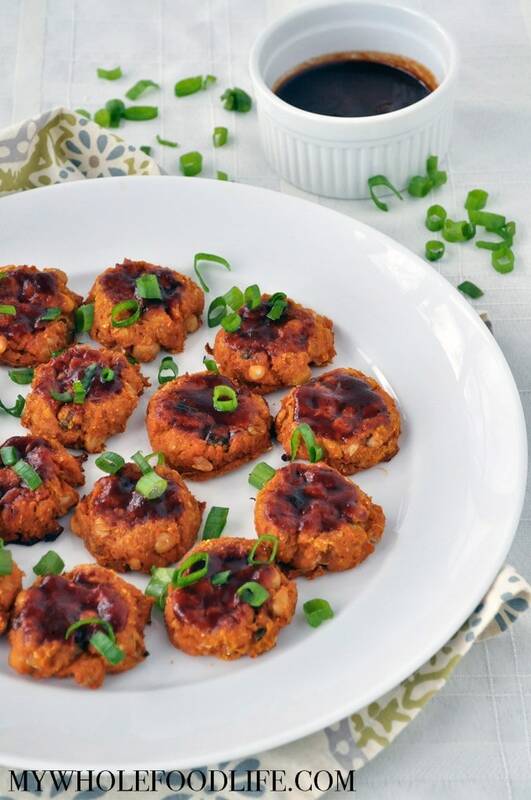 I love anything with sweet potato and chickpeas! This is my kind of recipe! I've got to make these! They look amazing! This is a very interesting recipe not only because I like looking for ways to encourage more consumption of sweet potatoes, but I'm intrigued by how you used chickpeas as a binder instead of egg. So cool! These are fantastic. I am a big fan of chickpeas! Love this and I think the kids will too! Thanks for sharing a great recipe! Great combination of ingredients and so easy to make, love! Hi Michelle! I am going to guess about 1/4 -1/2 cup water? Maybe start with 1/4 cup and slowly add more until the mixture looks sticky enough? I made these yesterday and really enjoy them. I think for my daughter I'll leave out the green onion next time. Today I reheated some by pan frying them with coconut oil and it gave them a nice crunch outside while remaining healthy. Thanks for this recipe! You are so welcome Lori! I am glad you liked them! I made them but they fall apart. Suggestions? Did you add the liquid from the canned chickpeas? Yes. I baked some of them and they fell apart, so I pan browned some others. Still fell apart. They're delicious but you have to use a spoon to eat. I'm sorry that happened. :( Mine did not do that. What is the sauce served with them?